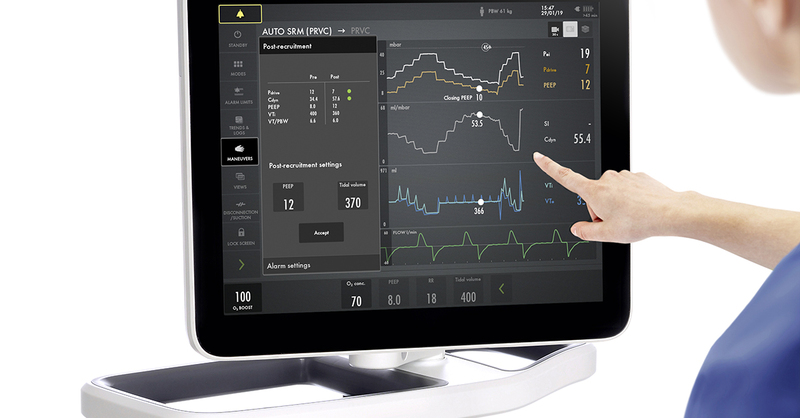 Getinge’s mechanical ventilator, Servo-u, is now launched in the updated version 4.0, with added automatic lung recruitment and transpulmonary pressure monitoring functions. This groundbreaking solution was made possible thanks to cooperation with over 100 clinicians and researchers worldwide, with the aim to make complex procedures easier for clinicians and safer for patients. Servo-u 4.0 will be introduced at the 39th International Symposium on Intensive Care and Emergency Medicine in Brussels. Mechanical ventilation is used in life support for millions of people each year, in everything from scheduled procedures to acute organ failure. It’s a vital technique, but it can also lead to injury. The best way to minimize this risk is to decide on the best protection and weaning strategy at the outset. Servo-u brings many options for personalized lung protection and weaning. All are easy to understand, implement and use, making it simple to integrate advanced personalized ventilation strategies into the daily patient care. The automatic lung recruitment function comes in two versions, Auto RM (Recruitment Maneuver) and Auto SRM (Stepwise Recruitment Maneuver). “Together with transpulmonary pressure monitoring, they make the 4.0 version a strong complement to our Acute Respiratory Distress Syndrome (ARDS) offering,” says Magnus Isaksson, Vice President of Marketing Acute Care Therapies at Getinge. The automatic maneuver to validate balloon positioning and filling has been developed to simplify workflow and improve positioning accuracy. A diagnostic view provides esophageal and transpulmonary pressure waveforms, with key parameters for safety assessment of controlled and spontaneous ventilation. Auto SRM is an automatic workflow for Stepwise recruit­ment maneuvers based on the Open Lung approach. The tool guides the clinician smoothly through stepwise recruitment, decre­mental PEEP titration, re-recruitment and post-recruitment personalization of PEEP based on optimal dynamic compliance. Diagnostic features include assessment of recruitability and provides additional decision support when patients do not respond to the recruitment maneuver. “Our new automatic lung recruitment makes it possible to standardize treatments and automatically document that the recruitment was properly performed. This means that the quality of upcoming studies will improve and we will now hopefully be able to prove the clinical benefit of lung recruitment for the most critically ill patients,” concludes Dr. Miray Kärnekull, Medical Director Critical Care at Getinge. Input from more than 100 clinicians and researchers from across the globe has been the base for Getinge when creating this groundbreaking solution, which aims at making complex procedures easier for clinicians, and at the same time safer for the patients. Learn more about Getinge’s mechanical ventilators. Note – Not all products listed here are available in all countries. For details, contact your Getinge representative. This document is intended for an international audience outside of the US.